This past week has been a wet one for many areas of Queensland and while we didn't receive anything like the rainfall totals experienced by those on the coast etc. we did manage to pick up some decent totals. Some areas of the garden are like a jungle which gets me down as I can't dig out all the weeds as some have just grown so tall and thick so I took a break from attacking it all to see how the flowers and veggies have benefited from the recent rain. Obviously hydrangeas like to be watered as this year the bush is huge. I was at Bunnings the other day and noticed that they had so many different coloured hydrangeas...not just the usual blue or pink so I asked if something had to be added to the soil to get those colours but with the new plants there is no need. After I left I thought I should have taken some photos but didn't get back there until a week later and by that time they had sold out completely. 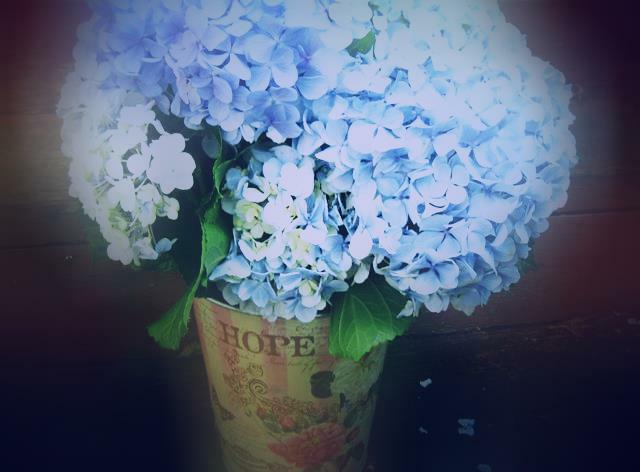 They were selling for $16 and $20 and, if you are interested in growing hydrangeas, they are well worth having a look at. 'Suyo Long' is a traditional long-fruited variety from China. It has a mild-flavoured, ribbed fruit growing up to 35 cm long and is considered a 'burpless' type. It copes well with hot weather. Growing on a trellis produces straight fruits and reduces fungal problems, this variety continued to produce through recent flooding rains with virtually no mildew. This is the first one that has grown so far and I wasn't sure if I picked it too early but it was already about 30cm (12in) long so took the chance. 'Golden Nugget' is a compact, bush Pumpkin variety developed in the USA as a replacement for sweet potatoes in cold climates. It is ideal for small gardens and containers. The fruit is small, round, 12 cm diameter, weighing 600 - 900g with a hard, bright orange skin. The orange flesh is dense and sweet. It stores well. The plants produce 5 to 8 fruit per bush. The CEO has several olive trees growing down the back which haven't produced any olives which isn't surprising seeing as they are never watered. However he did buy one a while back which never did get planted out and, as it has been sitting near my watersaver garden and still in the pot, I have been watering it regularly and, would you believe it, we actually have some olives growing for the first time. A few years ago Rhonda gave me an elderberry plant and this year there are enough berries to pick. The only problem is I don't know if they are ripe enough as they are dark purple and I wonder if they should be black. Does anyone know? I did read Rhonda's post about Hanno and Jamie picking the berries but couldn't see any mention of the colour they need to be. As my plant was taken from Rhonda's it is a sambucus nigra. I think the berries need to be black and according to some websites they should be cooked. Did you know the flowers are edible? I only found that out recently. Also I have inherited six roses. Just as well I took a photo of that bud on the macro setting on my camera otherwise I wouldn't have known there were aphids on it as I don't wear my glasses outside. Oops! Now... I know practically nothing about roses apart from the fact that they attract aphids and get blackspot. So I need to do a crash course in how to look after these plants. The CEO really HATES roses because of the thorns so we have never grown them but a new neighbour didn't want the ones growing in her garden and was going to throw them out so eventually they ended up here. They were moved after the 'right time' for transplanting roses so aren't in full sun as yet and I was thrilled to see the buds forming. Only two of the roses still have the label on them and one is a Queen Elizabeth rose and the other is an Esmerelda rose. I have no idea what the others are but when they flower I will take some photos and I am sure some rose lovers will help out with identifying them. How are things at your place? Did you receive some welcome rain? Your garden is beautiful, Chel. Sometimes I wonder how weeds grow so fast and well while my vegetables struggle. I planted okra at the wrong time, so only had one tiny okra so far. I saw tomatoes coming up on the only plant that survived, so I'm waiting until they are big enough to pick. Yes Nil, the plants often struggle while the weeds grow prolifically. LOL! Gorgeous flower photos Chel. We had over 40mls here in our part of South Australia last week. Unusual, and we're appreciating our lawn being green, and the garden beds looking lush. The weeds are difficult to keep up with though. Sally that is great that you are getting some rain down there as you have a fairly dry summer normally don't you? Weeds weeds wonderful weeds. I keep them short and it looks like the garden is full of something. Nobody but me knows they weeds. Ha ha, Susan, I am sure everyone would know what is growing at our place are weeds. Thanks for the link, Lyndie. I was in contact with Rhonda and she said the same so mine are nearly ready to pick. Just hope I get to them before the birds to though. LOL @Susan! not much growing in my garden atm, but we did get lots of water & 5 trees got planted out on Sunday too. i was given some Leeks recently & i planted the bottoms back out in the ground, now they are growing really well am looking forward to harvesting those soon. LOVE roses, have a blue moon here, no others though, too hard to get them to survive (lost many when i first planted the garden up) only blue moon & it get beautiful mauve flowers with a subtle fragrance. those that you mentioned are gorgeous! good luck with planting them; garlic chives do well under planted; just pop them in the garden somewhere where you won't brush them when you walk past but also able to get to them for cut flowers. lots of weeds here too ... maybe we should invest in that book about weeds & how to use them? Selina when I looked on the radar the other day it was very green around your area so I presumed you were getting lots of rain. That's great. Your Blue Moon rose sounds beautiful. Your flowers are gorgeous! Banana peels at the base of your rose bushes will get rid of the aphids. It really works! Love and Merry Christmas! Thanks Mary, I will give that a try. With all the heat, humidity and rain my garden has just about become a jungle. There are weeds everywhere and the Vietnamese mint has decided it will take over the whole garden. It looks a lot like wandering jew. I will have to get in and get stuck into pulling out the weeds before they set seeds. At least as young plants they can go straight into the compost or chopped and dropped onto the garden. My Vietnamese mint is the same, Jane. Thankfully I have it in a pot. We have had storms all day today so there will be even more weeds soon.